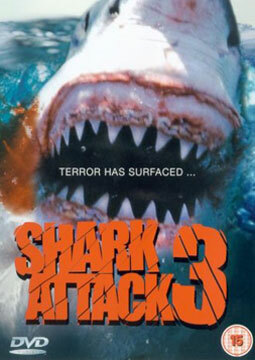 Filmed in Bulgaria, Shark Attack 3: Megalodon has achieved the status of B-movie cult classic, with a now infamous ad-lib from John that has achieved legendary status among fans of the genre. "In the autumn of 2001, the producers of the Shark Attack DVD film series made me an offer that, frankly, at the time was hard to refuse. Titans had been cancelled and my first cabaret booking in New York was a few mortgage payments away, so I accepted the male lead in the movie Shark Attack 3: Megalodon, which was set to film in Sofia, Bulgaria. The film has since become a cult classic in this fishy genre because, among other things, it has one of the most famous awful lines of movie dialogue ever." 24 million years ago, Megalodon was a 20-ton voracious killing machine with a 10-foot wide gaping bite who snacked on T-Rex and survived the Ice Age. But "Meg" has been thought to be extinct for millions of years...until now. When two determined researchers discover a colossal shark tooth in the warm waters of the Mexican coast, their worst fears come to the surface. The most menacing predator to ever rule the earth is alive and well and ripping helpless victims to shreds! Get ready to discover the only thing more horrifying then hunting for the fiercest killer man has ever known...meeting him face to face!